Anyone wondering about the priorities of Mrs Theresa May should follow her actions from the moment she learned she was to become Britain’s next Prime Minister. Her first act was to sign a pledge committing her to remember the Holocaust and “stand up to hatred and intolerance”. And her second was to spend the evening before her confirmation by the Queen at a private dinner at the home of Chief Rabbi Ephraim Mirvis. In a parliamentary career marked by cowardice and a tendency to go along with whichever political wind is blowing, it is hard to say which has been Mrs Theresa May’s most inglorious moment. Was it her decision, as Home Secretary, to throw open Britain’s borders and allow immigration to arise to record levels — after being elected specifically on a promise to reduce it? Perhaps it was her plans to target “non-violent extremists” via blacklists, internet free-speech restrictions and movement bans? For many nationalists, the most egregious moment in this wretched woman’s career came in a speech she gave at the Finchley United Synagogue in April 2015 when she defiled the memory of British servicemen killed in Palestine 1939 — 1948 by praising, instead, their Jewish terrorist killers. So as today we celebrate the independence of the state of Israel and pay our respects to those who have fought so hard for it…. We remember the sacrifice of those who fought to achieve and protect that independence…. Warming to her theme she said “without its Jews, Britain would not be Britain,” and then she said “Jewish people have long been an important and integral part of this country”. 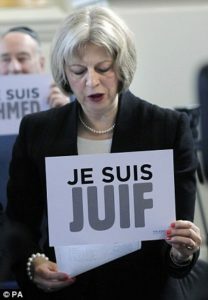 Asserting that “the safety of the Jewish people can never be taken for granted,” Mrs May said it is a “tragic fact of history that the Jewish people have had to protect themselves against repeated attempts to obliterate them.” She even repeated David Cameron’s words that, “If the Jewish community does not feel secure then our whole national fabric is diminished.” Fine words, if only the White communities of Rotherham and elsewhere could find someone to defend their interests with as much passion. It looks as if his defenestration may come at the hands of a veteran leftie. In their political outlook, leadership challenger Angela Eagle is pretty much indistinguishable from Corbyn but is shrewd enough to stay away from the Middle East. She voted for the Iraq war and two years ago was one of a handful of MPs who voted against recognising the state of Palestine. Significantly the Times of Israel reported that she recently met a delegation of Jewish students to pledge her committment to fighting anti-Semitism.